Agrisystems International had the opportunity to attend this year’s Organic Policy Conference as part of ORGANIC WEEK in Washington D.C. in May. The purpose of the conference was to bring OTA members together with our Nation’s Representatives — to network, to discuss the state of the Organic Industry, and to ensure that Organic Priorities are part of the next FARM BILL. Several hundred organic industry members — small business owners, educators, farmers, handlers, etc; had the opportunity to hear from some of our Congressional representatives during a day-long Policy Conference. Farm Bill — why does it matter? Organic funding is a SMALL part of the overall agricultural budget, but it is critical to the success of the industry. Organic is an almost $50 Billion industry in 2017, but the NOP is only budgeted $9 Million to manage the program, including compliance, oversight, and enforcement. Organic is the fastest growing segment of the U.S. Agricultural market, based on consumer demand — which horse are you going to put your money behind? Organic label is critical for consumer trust — we have to make sure it stays that way. Label fraud with organic grain imported from Turkey, and issues with inconsistent livestock standards — these are all reasons to ensure that NOP remains STRONG. OTA members broke up into small groups to meet with over 50 Representatives from across the country as part of Organic Week. Focus was on the Freshmen class, GOP representatives, and agricultural committee members. 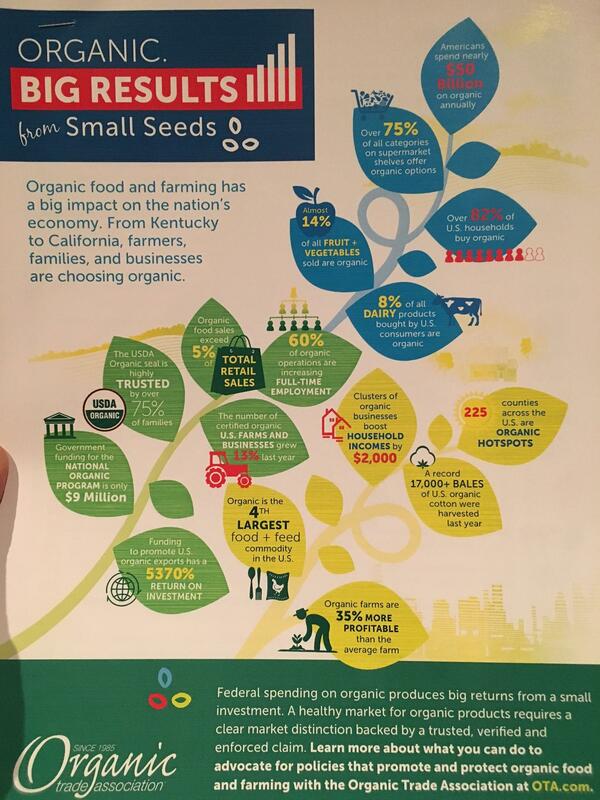 Organic is good for the U.S. Economy! Hot Spots in Rural Economies notice the difference — shown to reduce poverty and boost median income by an average of $2000 annually. It is an elective VOLUNTARY standard — no one is forced to become organic. It is market based, and consumers trust the Organic Seal. Over 80% of consumers purchase organic products — of all food growth in the U.S., organic grew at over 8% per year, vs. conventional growth at 0.6%. Support NOP Funding! Only $9 million for NOP enforcement for a $50 Billion industry? Support Cost-Share Funding — for small or transitioning farmers. We need MORE domestic sources of certified organic grain (corn & soy) so we don’t have to import. Support export promotion, and support funding to expand compliance/enforcement of imported organic products. Support Organic Research Funding at a minimum of $50 Million / year so it becomes a standard baseline funding and doesn’t require repeat requests. Join the House Organic Caucus (if applicable) — get educated about Organic. Support the implementation of Organic Livestock and Poultry Practices rule NOW! Overall – a very worthwhile and important experience!